Proportion London joined the Victoria and Albert Museum in celebrating Mary Quant’s sartorial efforts to liberate women from formality with bespoke, fun figures. Collaboratively crafted with the V&A, the dynamic mannequins display clothing from the 50s, 60s, and 70s when Quant revolutionised the high street. The mannequins were adapted to suit the garments, combining and altering elements from Proportion’s Mademoiselle and Theory collections, identified by their energetic elegance and endless legs frozen in play. 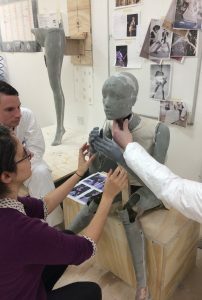 A series of the figures were shortened and adapted with a moulded-heel design, inspired by the mannequins in the startling windows displays of Quant’s Kings Road fashion boutique, ‘bazaar’. Decade-influenced hairstyles complete the retrospective figures. Wigs styled into back-combed beehives, and cut into Quant’s iconic five-point bob, signify the freedom of movement and blurred gender lines Mary Quant strongly influenced with her youthquake that shook England. A handful of unique, playful poses steal the spotlight. The tailor-made figures, created with V&A, re-enact several iconic Quant campaigns, illustrating liberating, leg-revealing shots that unleashed an attitude revolution that changed much more than just fashion. The exhibition Mary Quant runs from 6 April 2019 – 16 February 2020. Tickets from £12.